Like many of you, we were snowed in today and we had so much fun…without going outside at all! With a seven year old, a five year old, a three year old and a one year old, I just don’t have the energy to bundle everyone up for a five minute trip outside and then back again! And again! And again! One of the best tips I’ve ever learned was from my daughter’s preschool (and I’ve seen a couple of other brilliant parents do it too): BRING THE SNOW INSIDE! 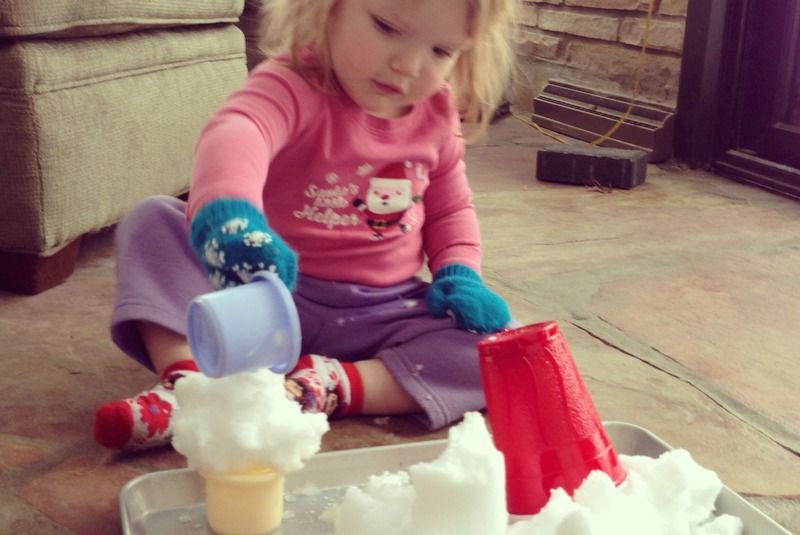 We scooped up a bit of snow and put it into a bowl or on a cookie sheet and let Lulu play in the snow with assorted cups and scoops on the floor. The table would work just fine too! Worried? Grab a plastic or vinyl tablecloth and lay it out on the floor or on the table. You can also put snow into an empty bathtub! We did this several times throughout the day and Lulu LOVED it! She wore mittens and had such a blast! What’s better than playing with snow? EATING IT! Lulu was having a fine time just melting the snow on her tongue but I decided that we would have REAL snow cones! I balled up some snow and put it into a little plastic cup and poured juice over it. If you have food coloring you can use that too. Different varieties of juice make for a pretty yummy treat and you really don’t need that much at all. 1. Scoop snow into a large bowl. I know this seems like a large amount, but the other ingredients reduce it down. 2. Pour condensed milk and vanilla over snow and mix well. I would add other toppings and syrups if you have them! We tried chocolate and caramel and some peppermint extract. Half of the fun was making it and oh my gosh is it sweet! We had the best luck with our frozen bubbles when temps were well below freezing. It worked better when we set our bubbles outside a while before we started and let them get really, really cold. Then, just blow a bubble, catch it on the wand and watch as it freezes before your eyes! Then you can “shatter” it and tear it! These are a few winter fun ideas that keep you mostly warm, and if the snow has drifted right up to your back door the way it has ours, you don’t even have to set foot outside to play in the snow. Looking for some great Indy Area Snow Sledding Hills? We have a list for that!